Today’s story from Isaiah comes from the same time period as last week’s story from Micah. In fact, the prophet Isaiah was a contemporary of the prophet Micah. The big difference between the two is that Micah was a prophet from a little town out in the boondocks of the kingdom, and Isaiah was a prophet in the capital city of Jerusalem where our story takes place. In Micah, the Assyrian empire was at the doorstep of the kingdom of Judah, ready to pounce on them like a lioness after her prey. And in today’s story, the lioness has pounced. The Assyrian army has taken every city in the kingdom but one, Jerusalem. 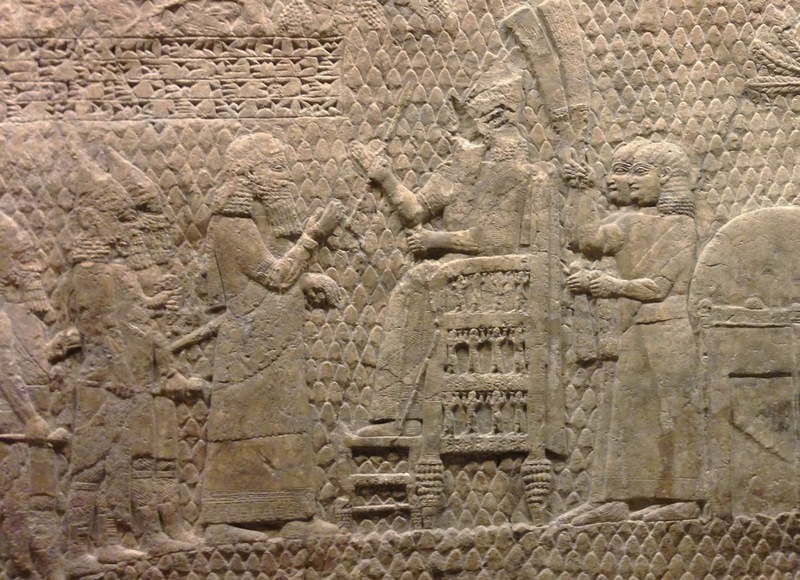 This story of Assyria’s conquest of Judah was widely recorded. Not only does it appear here in scripture but also in Assyrian documents, and even in these huge Assyrian palace reliefs, part of which you can see here. So apparently, this was a huge story back in Isaiah’s day, this was breaking news, major headlines. 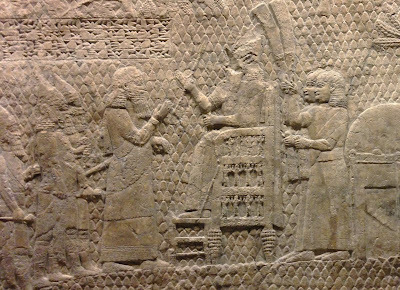 So, the Assyrian king has taken every part of the kingdom of Judah except its capital city Jerusalem. His army is at the gate of the city. And his commander, from the city limits, begins to taunt the people of Jerusalem, in what may possibly be, the first recorded incident of “fake news.” Think about it, this commander tells them, Don’t listen to your king Jerusalem! He’s a liar! He won’t save you! Just surrender now and no one has to die! I’ll tell you what, if you give up now, I’ll let you stay in your own homes, and you’ll be able to eat from your own gardens and drink from your own vines. Well, until we come and take you all to a new land, but that’s beside the point. And then, the commander makes a pretty compelling case as to why they should surrender. He says, you can wait for your God to save you if you want to, but look around you. Did any of the gods of all the other nations save them from me? And then he lists them one by one! Did their God save them? Did their God save them? Did theirs? Did theirs? Nobody had to answer that question. Everybody knew. It’s all that’d been on the news! The answer was, no. Their gods didn’t save them. In fact, our God didn’t save our siblings to the north in the kingdom of Israel. And then the commander goes for the jugular and asks, “Will the Lord save Jerusalem from my power?” Like I said, it was a pretty compelling case. How could they argue against that? And so Judah’s king is so saddened by these words he rips his clothes. Ripping your clothes to express sadness or anger was a thing back then. Don’t question it, just go with it. So he seeks the advice of the prophet Isaiah. He’s probably thinking, maybe this is it! Maybe this is the end. Maybe the best I can do for my people is surrender. But he’s not lost all hope, and so he asks the prophet to offer up a prayer on behalf of the city. Isaiah does him one better! He says, “Don’t be afraid of the words you heard.” I’m going to spread a rumor (more fake news), a rumor that will make the Assyrian king go home. And that’s exactly what happens. And Jerusalem remains intact to see another day. Now, if you take a step back, or take a birds-eye view of this story, what we really have here between the Assyrian king and Jerusalem is a cold war, “a state of political hostility characterized by threats, propaganda, and other measures short of open warfare.” In other words, no pun intended, it’s a war of words. Now hold that thought for just a moment. Because the last thing we read was a vision that Isaiah had, a vision of a future Jerusalem, a future filled with God’s people being taught God’s ways as God walked by their side, a future filled with hope, a future filled with peace. 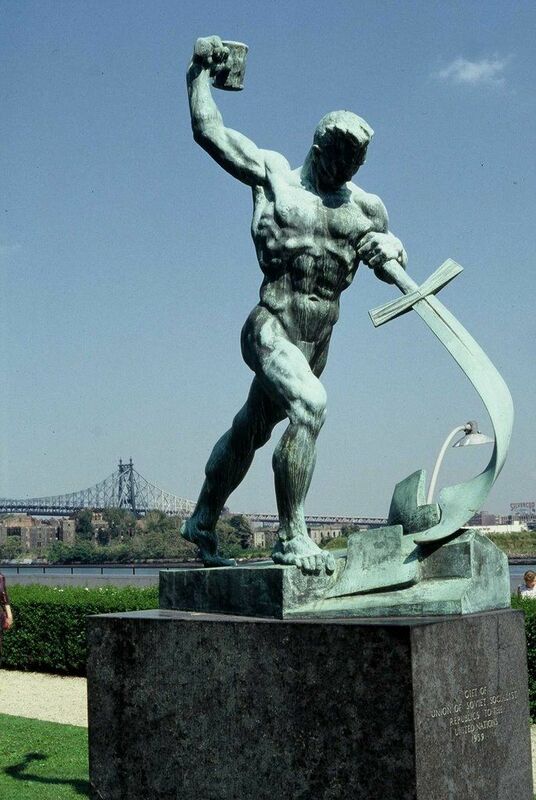 Here’s how that vision ended, “Then they will beat their swords into iron plows and their spears into pruning tools. Nation will not take up sword against nation; they will no longer learn how to make war.” And that’s when I heard that familiar phrase of beating swords into plows in a way I never had before. You see, usually, when we think of that phrase, beating swords into plows, we think big, we think of nations, we think of armies, ceasing to use their weapons, sometimes weapons of mass destruction even. And although I’m usually pushing you to think big, I want you to think small in this instance. I want you to think of the weapons that we everyday folk use most often. And no I’m not talking about handguns or assault rifles, don’t get me started on those! I’m talking about words. I connected that phrase, beating swords into plows, with this war of words that those two kings were having with each other, and that made me think of the war of words that is plaguing our great nation today. Now, I’m no sociologist, but I don’t think our current use of words as weapons began with the internet. However, I do think the internet has given us a vehicle, which we can commit hit and runs with, like never before! Maybe we’ve always been like this and the internet, particularly social media, has just shed a light on it, exposed it! But the words we hear today, and by “words” I don’t mean foul language, I mean the way we communicate with each other, and not just on social media, but the way that politicians use words, the way our newscasters use words, the way our media uses words: as weapons; just seems out of control!—the personal attacks, the name-calling, the lies, the deceptions, the lack of empathy, the lack of respect, the lack of humanity. Now, I want you to hear me clearly. I’m not talking about criticizing a policy. I’m not talking about criticizing someone’s behavior even! I’m talking about saying downright evil things about someone’s personhood, especially when we don’t even personally know the person! And where does that even get us anyway? What does it accomplish? I was watching a video that was recently released from a protest outside of a Confederate monument somewhere in the South. A guy pulls his truck over and just starts yelling at the top of his lungs at these protesters, and from the sound of it, I think there was just a couple of them, we’re not talking about a lot of people. And he’s yelling obscenities at them and tells them that Jesus hates them and that Jesus wants them to go to hell. And these protestors remained calm throughout. I probably would not have, I was practically yelling at my computer screen while I watched the video! And at one point in the video, one of the protestors, asked the screaming fella, in a very calm voice, “Do you feel better?” And at least the guy was honest because he yelled back, “No! I don’t feel better!” It would have been comical if it hadn’t been so ugly—but back to swords and plows. I believe that Isaiah’s vision of the future, a vision of people beating their swords into plows, beating their weapons of war into farm tools, into tools of growth, into tools of nurture, into tools of life, I believe that vision included us, today, you and I, here and now. And I believe, that one of those weapons that we are called to beat into plows, is our words. How else are we to expect a change to happen, in the way that the world communicates with each other, if we don’t expect that change to happen right here? And if you’re one of those people that had a parent like Thumper’s mom, and this comes natural to you, then great! This sermon’s probably not for you. It’s for the rest of us, including myself! The “riverside” is a reference to the transforming work of baptism, where God calls us into something new, into a way of life that is different than what the world has known. Where we find warfare, we are called to peace. Where we find hate, we are called to love. Where we find cruelty, we are called to kindness. Where we find weapons, we are called to plows. Where we find hurtful words, we are called to use life-giving words. So let us put that into action today, you and I, here and now, by this seemingly simple act, in writing these cards to the victims of fire, to our neighbors to the north, in Paradise—with our words of care, not harm; with our words of life, not death; with our words hope, not despair, with our words of love, not hate. Thanks be to God. Amen.